It can be overwhelming to choose a birdhouse with all the shapes, styles, and sizes available, but birds aren't picky about their residences. Simple birdhouses can do the job just fine, so long as the house has the basic requirements to be a safe place to raise baby birds. A simple, basic birdhouse is very practical in form and function, without extra frills, but it still does the job. There are only four things a basic house must have to be safe and appropriate for birds. Entrance: Every birdhouse needs a way for birds to get in, and the larger the hole, the larger the species that can use the house. That does not mean the entrance must be exactly a precise size for certain birds to use; if they can fit through the hole, they can use the house. The largest holes, however, might be more inviting to less welcome bully birds, pests, or predators. Drainage: A few drainage holes will go a long way to keeping a birdhouse clean and safe by allowing feces and debris to easily wash away from a vulnerable nest. Ideally, drainage holes should be positioned where they will not be blocked by nesting material, and they should not be so large that they pose a threat to small hatchlings. Ventilation: A ventilation slat or holes is critical to regulating temperature and air circulation inside a birdhouse, particularly during the hot summer breeding season when the house is filled with chicks. A gap under the eaves or a few holes near the top of the walls will provide adequate ventilation, but the holes should be sheltered from rain. Mounting Ability: A birdhouse cannot be so simple so there is no way to mount it for birds to use. Some houses come with hooks or brackets for easy mounting, or houses can be hung from trees or poles. The very simplest house may just be nailed to a pole or tree, with nails or screws long enough to penetrate through the back of the house and deep enough into the tree or pole surface to provide a firm hold. There are a number of additional features, while useful, that a birdhouse does not necessarily need in order to be useful. 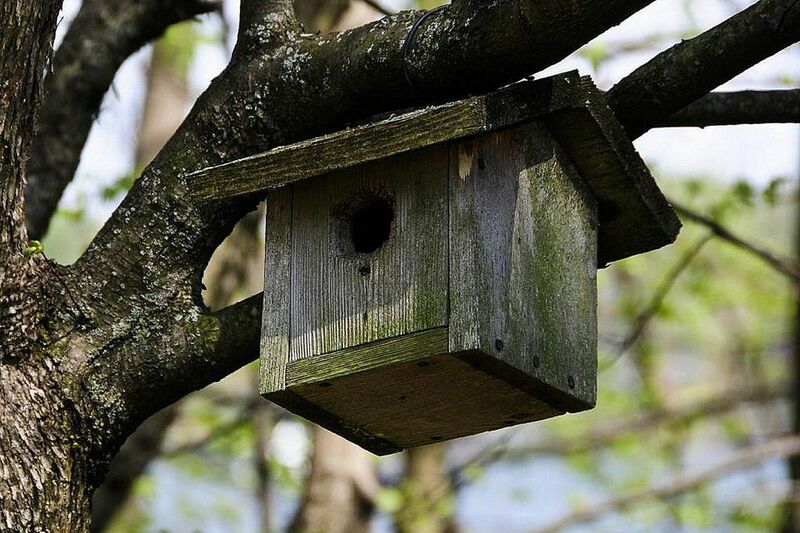 If a house has these extra features, it isn't necessarily a bad bird house, and in fact it might be even better for certain birds, but these features aren't critical for a basic bird house. Perch: A perch is never necessary for a birdhouse, and only gives predators easier access to the house. A small nub of a perch can be a quaint decoration, however. Paint: Painting may make a house more attractive to humans, but not to birds. An unpainted house is fine, but if paint is preferred, natural tones or stains are the best options. Decorations: Decorations on a birdhouse can be charming, but have no influence on the birds. Natural decorations such as a small pine bough, bark chips, or moss can provide minimal camouflage for the house. Opening Panel: While a side panel or roof that opens makes it much easier to clean the birdhouse, it is possible to clean a house without the added structural complexity. Specific Dimensions: While some bird species do prefer houses of specific dimensions, most birds are flexible in their requirements. Birders who are less particular about the birds that use the house don't need to fret about exact measurements. These birds may not only use simple birdhouses, but they are also likely to use the houses as roost boxes if they are left up through the winter. Purple Martins: These colonial birds require communal housing in wide, open areas. Purple martin houses are more specialized to meet their needs, and can be grouped in large colonies to accommodate flocks of purple martins. Ducks: Cavity-nesting ducks require much larger houses, not basic backyard designs. These houses must also be positioned near water to be suitable. Birders interested in providing duck housing should opt for duck boxes instead of simple houses. Owls and Raptors: Raptors that use birdhouses generally need larger houses than other birds, and the houses should be more isolated for the birds to feel secure. Barn owl boxes are a good choice that may be used not only by owls, but by other raptors as well. It might take a birder weeks or months to find the perfect house to get started feeding birds, design a bird-friendly landscape, and keep a yard list, but it doesn't take an elaborate birdhouse to attract nesting birds and entice them to raise their feathered families. By understanding what a simple birdhouse does and doesn't need, birders can easily get started with birdhouses.